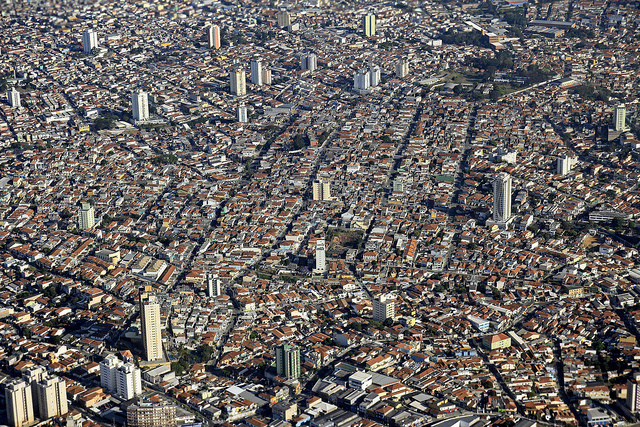 Size and density are influential in determining the livability of a city. Photo by Magalie L'Abbé. Earlier this year, we wrote about the symbolism of October 31 in marking the day the world population reached 7 billion people. A design firm based in Boston, Mass., Fathom Information Design, created “Dencity,” a map of global population density as the world reaches this important milestone. The map uses different size and color circles to represent the distribution of population and density around the world. Larger and darker circles show areas with fewer people. Smaller and brighter circles represent more crowded areas. Larger, darker circles show areas with fewer people, while smaller, brighter circles highlight crowded cities. Design by Fathom. Density is an important factor determining quality of life, as we saw from the livability ranking report the Economist Intelligence Unit published earlier this year. An important finding of the report was distinguishing the common ground between livable cities as their size and density. Read more about this report here. Fathom’s “Dencity” maps are available for purchase on the company’s website. Click here to access. The company has also used other interesting visualizations to display data, like population aging and the frequency of health concerns. Click here to see the company’s data visualization portfolio.